N. Korean, Swedish Officials Resuming Talks Amid Trump-Kim Summit Speculation - Integration Through Media ....! 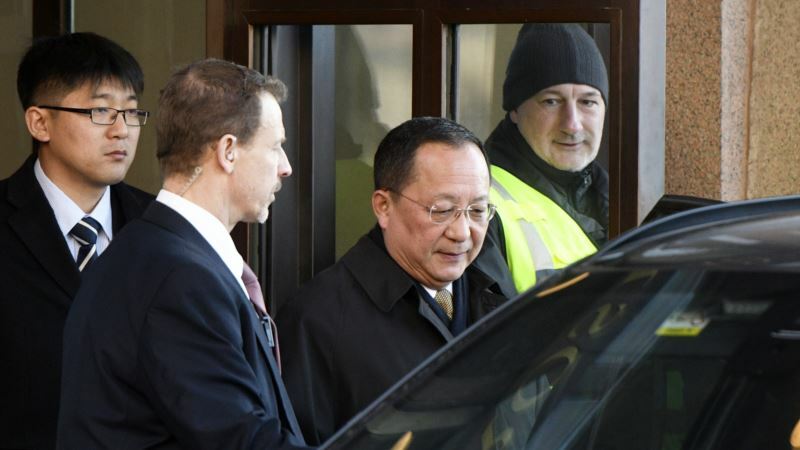 (VOA): Talks are resuming Saturday in Sweden between Swedish officials and North Korean Foreign Minister Ri Yong Ho. Some global observers say the discussions could help pave the way for a meeting between the leaders of U.S. President Donald Trump and North Korean leader Kim Jong Un. The talks in Stockholm initially were scheduled to end Friday, according to a source with knowledge of the situation. Swedish U.N. Ambassador Olof Skoog said Friday his country is trying to help de-escalate tensions on the Korean Peninsula by hosting the talks. “The security situation on the peninsula is one of the most pressing issues on the world agenda right now, and if Sweden can play a part in de-escalation there, this is what we're trying to do,” Skoog told reporters in New York. Minister Ri and Swedish Prime Minister Stefan Lofven met briefly in Stockholm Friday, but Skoog and Lofven's spokesman would not disclose what the two leaders discussed. Skoog added, however, the talks in Stockholm would “hopefully” help “create a good environment for such a meeting” and declined to comment when asked if Sweden would host a meeting of the U.S. and North Korean leaders. “We just want to be helpful in pursuing a de-escalation on the peninsula,” he said. U.S. President Donald Trump reaffirmed his plan to meet by the end of May with North Korean leader Kim Jong Un to negotiate Pyongyang's nuclear program, the White House said Friday. In a phone call with South Korean President Moon Jae-in, Trump expressed “cautious optimism” over recent developments regarding North Korea. The White House said the two leaders discussed preparations for their upcoming negotiations with North Korea and agreed “concrete actions, not words” were key to any denuclearization of the Korean Peninsula. North Korea, however, has not officially confirmed the meeting and no specific time or venue has been set. South Korea’s senior press secretary Yoon Young-chan said Moon pledged to “create an atmosphere for the successful opening of the U.S.-North Korean summit” when he meets with the North Korean leader in April. South Korea said Moon also talked by phone Friday with Japanese Prime Minister Shinzo Abe, who expressed the possibility of having a North Korea-Japan dialogue. A South Korean spokesman said the two leaders agreed to strengthen their cooperation to work together and with the United States to bring about the denuclearization of North Korea. Earlier, Im Jong-seok, Moon's chief of staff, said South Korea is seeking high-level talks this month with North Korea to prepare for the inter-Korea summit in April. He also said Moon could meet with Trump after the inter-Korea summit, but before Trump holds his planned meeting with the North Korean leader in May. “We've decided to narrow down the agenda topics to denuclearizing the Korean peninsula, securing permanent peace to ease military tension, and new, bold ways to take inter-Korean relations forward,” Im, the head of South Korea's summit preparation team, told reporters. The upcoming summits also were discussed Friday in Washington by the top diplomats from South Korea, Japan and the U.S.
South Korean Foreign Minister Kang Kyung-wha and her Japanese counterpart, Taro Kono, met separately with U.S. Deputy Secretary of State John Sullivan, who is serving as acting secretary of state after Rex Tillerson was fired by Trump earlier this week. Sullivan's meeting with Kono affirmed the importance of the U.S.-Japan alliance in the East Asian region, State Department spokesperson Heather Nauert said. Trump has chosen CIA Director Mike Pompeo to replace Tillerson, but Pompeo is not able to have formal contacts with the foreign ministers of the two Koreas until his nomination is approved by the Senate.